Other Products by BPI Sports. Search other Pre-Workouts products. BPI Sports 1.M.R Vortex - the newest evolution of pre-workouts formulated to enhance and intensify the quality of your workouts. 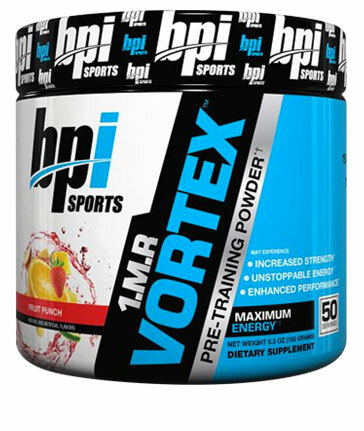 BPI Sports 1.M.R Vortex delivers energy, focus and strength and provides enhanced mind / muscle connection and laser focus making each workout count. 1.M.R Vortex produces more energised workouts, increased endurance, strength and overall productivity in the gym. Hit every repetition and set at full force with BPI Sports 1.M.R Vortex. Mix 1 scoop (1 serving) of 1.M.R Vortex with 175 - 235ml of water and consume 15 - 20 minutes prior to training. Do not exceed servings (2 scoops) in a 24 hour period. Avoid eating food or drinking a protein shake within an hour after consuming. To avoid sleeplessness do not take withing 4 hours of bedtime. Taking 1.M.R Vortex with food or on a full stomach may diminish its effects. OTHER INGREDIENTS: Citric acid, malic acid, natural and artificial flavours, maltodextrin, sucralose, silica, acesulfame-K and FD&C Red No. 40.